Availability:: Usually ships same or next business day. 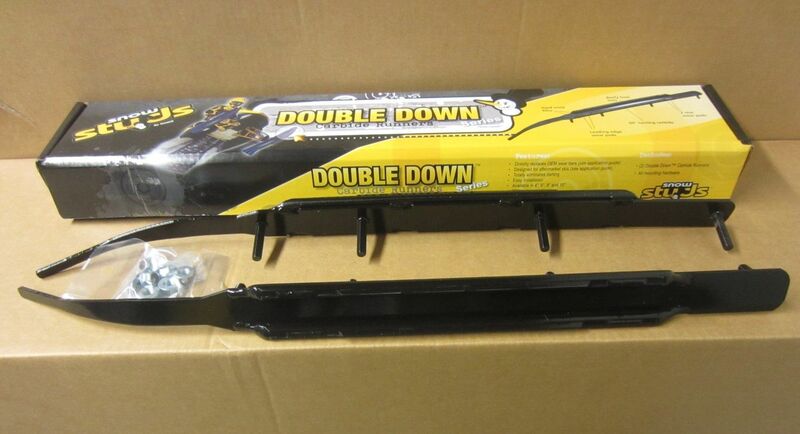 These super wide Double Down runners will have you steering straighter with less effort and more confidence. That same wide spacing is what helps you carve tight turns, the Achilles heel of most other double runner designs. For over 8 years now the Double Down runners have been redefining what the term handling means to snowmobilers, why not see the difference for yourself? Photo is an example of construction, compare the stud locations on your skis to the dimensions on the drawing to ensure these will actually fit. Completely eliminates darting on the trail. 60° steering carbide on each of two beefy 1/2" bars per ski, stud-welded 3/8" studs. Carbide brazed deep into the bar allowing for more miles before replacement. Wearpads front and back make them last longer than you would even imagine. Sold per pair to complete one sled. Notes: These runners require drilling of a 4th stud hole to support the front of the runner on some older skis. On newer model skis the 4th hole is already there and no drilling is necessary. Instructions are printed on the package. This part number supercedes RD7308 for steel skis and RD7408 for Plastic and Steel E-Z steer skis as the bolt patterns are the same.